Ion Far Infrared Light treatment helps to restore moisture especially for dry skin. It uses soft electric currents for stimulating, refreshing and rejuvenating your skin. Charged particles are electrically transported into the deeper layers of your skin through gels and restore skin by encouraging elastic production with electrode stimulation and it promote the adsorption of products used, driving them deeper into the pores. Ultrasonic Peeling work on a deeper level of skin with a low-frequency ultrasonic vibration to deeply penetrate dirt and grime on the face. It also pulses water into the skin very quickly in order to flush out dirt that trapped in the pores. Exfoliate dead skin cells for healthier complexion and reduce fine lines without redness and irritation. Skin is restored to a smooth, youthful glow. Micro exfoliation through a delicate diamond dusted wand effects a progressive and controlled superficial skin polishing. This gentle abrasive technique leaves the skin feeling smooth, soft and luminous. This facial treatment also come with an effective all –natural ampoule extracts for treating uneven skin tone, pigmentation, acne scars, wrinkles and lines, sagging skin and dark eye circles. The RF treatment passes radio frequency electricity through the skin to heat up tissue. This is supposed to make the tissue contract and, as is true with any injury to skin, it begins making collagen. This treatment is an effective and comfortable way to achieve skin tightening and wrinkle reduction. Enhances skin elasticity has the effect of contouring the face by relaxing frozen muscles. After a course of treatments you can enjoy tighter, younger looking skin with improved skin tone, texture and elasticity. Oxygen Infusion Jet Therapy is one of the newest anti-aging treatments to hit the market. The basic idea behind this beauty treatment is to apply oxygen to the skin, firming up the skin, softening the appearance of fine lines and wrinkle, improving blood circulation and create a radiant look. Blue LED Cold Anti Acne Facial is for sensitive skin and with the cold chromo technology. Relaxing and purifying. The blue wavelengths have powerful anti-bacterial properties that cleanse and purify the skin. They kill the acne-causing bacteria acne and have anti-spasmodic properties that relieve tension. Red LED Mask Chromo Therapy is rejuvenating. Red Light is good for all skin types. It rejuvenates the skin by improving blood flow and increasing the collagen production. Immediate radiance glow and whitening. It doesn’t just leave the skin looking younger, but makes it feel younger deep down. In Chinese culture, Jade is considered the health, wealth and longevity stone and also known for healing properties which relax the nervous system and aid in removal of toxins. Warm Jade therapy bring deep relaxation and reduce inflammation. Because of its composition of iron, magnesium and calcium, your skin will feel soft and brighter. Micro Current is a low level of electricity that mirrors the body’s own natural electrical currents, triggering chemical reactions at a cellular level to enhance the production of natural collagen and elastin, provide circulatory benefits, and re-educate the muscle of the face. The result is immediate firming, smoothing, and re-hydration of the skin while reducing the appearance of fine lines and wrinkles. Micro Current lifts, sculpts and tightens pores, provides immediate results and has no downtime. Nothing can age you as fast as droopy eyes with fine lines and wrinkles. This treatment can reduces wrinkles, eye bags, puffiness and darkness circle around your eyes area. Enjoy an instant eye lift now! In Chinese culture, Jade is considered the health, wealth and longevity stone and also known for healing properties which relax the nervous system and aid in removal of toxins. Because of its composition of iron, magnesium and calcium, your skin will feel soft, brighter and also treat sagging skin, iron out wrinkle. 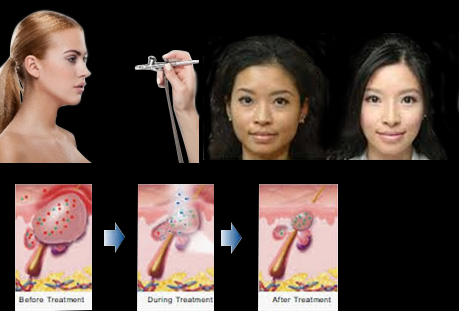 Ion Far Infrared treatment helps to restore moisture especially for dry skin. It uses soft electric currents for stimulating, refreshing and rejuvenating your skin. Charged particles are electrically transported into the deeper layers of your skin through gels and restore skin by encouraging elastic production with electrode stimulation and it promote the adsorption of products used, driving them deeper into the pores. People sometimes go to great lengths to prevent and treat wrinkles on their face, yet forget that the neck area needs attention as well, and that the skin in this area is even more mobile than that in the face. It can reduce fine lines, restores elasticity, nourishes, hydrates the skin and produce a firm and younger looking neck. Micro Current is a low level of electricity that mirrors the body’s own natural electrical currents, triggering chemical reactions at a cellular level to enhance the production of natural collagen and elastin, provide circulatory benefits, and re-educate the muscle of the face. The result is immediate firming, smoothing, and re-hydration of the skin while reducing the appearance of fine lines and wrinkles. Micro Current lifts, sculpts and tightens, provides immediate results and has no downtime.